This page has multiplication tables and charts. If you're looking for Basic Fact Worksheets, please go to this section of the site: Multiplication Worksheets. If you're looking for worksheets on multiplying bigger numbers, then you'll want to go here: Double Digit Multiplication. This zero through nine multiplication table is blank, so students can fill in the answers. This multiplication table is only partly filled in. Students can fill in the empty squares. This entire table is filled in so students can use it for reference purposes. This page contains four miniature desktop charts that you can cut out for student reference. Here's a blank 0 through 12 multiplication table has empty boxes for students to fill in. Many of the boxes are empty, but some are already filled in. Kids can complete this scrambled multiplication table. All of the boxes are filled in; Use as a reference chart. Here's a set of four miniature reference tables that can be cut apart. Print out this empty multiplication fact sheet that ranges from 0 through 12. 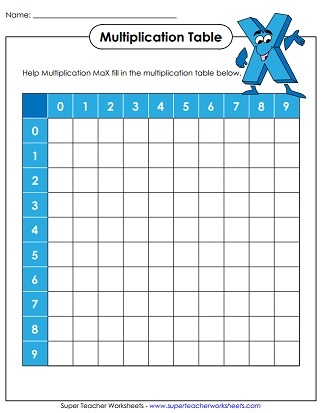 Print out this filled in multiplication fact sheet that ranges from 0 through 12. Fill in an empty multiplication table, from 0-15. A partially filled in multiplication table, from 0-15. Filled in multiplication table from 0-15. 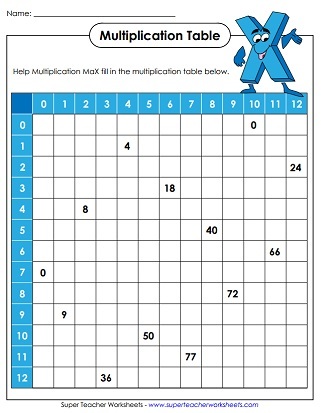 Print this set of four miniature 0-15 multiplication tables for students' desktops. Cut and use the L-shaped tool to view an array for any basic multiplication fact up to 10. 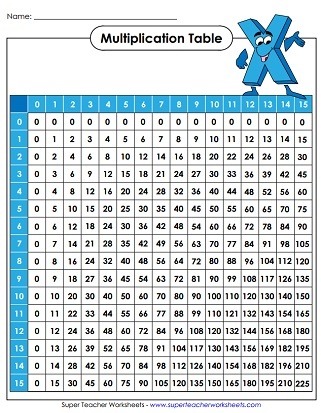 This multiplication table includes negative numbers. It has facts from -4 up to +4. Lots of fun games and worksheets to help your students learn their basic facts. Blank lattice grids and printable lattice problems for practice. The worksheets in this section focus on the properties of multiplication, including the associative property and the distributive property.